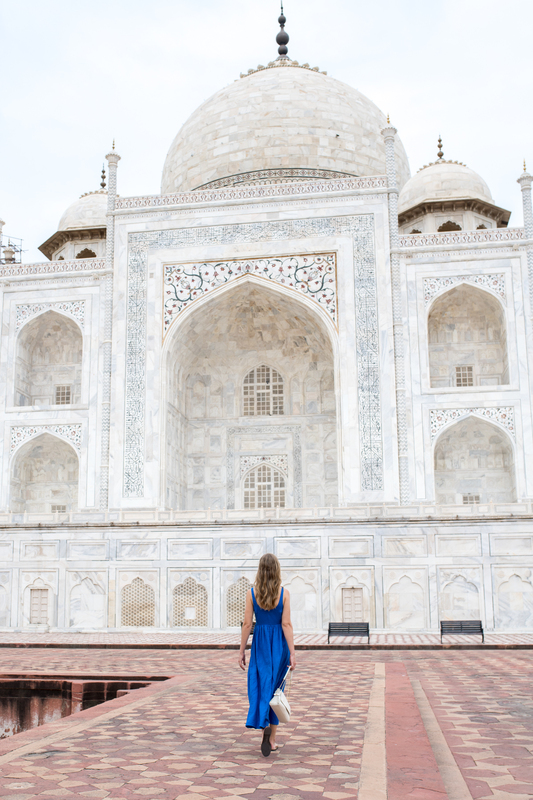 No first time visitor’s trip to India would be complete without visiting the Taj Mahal. 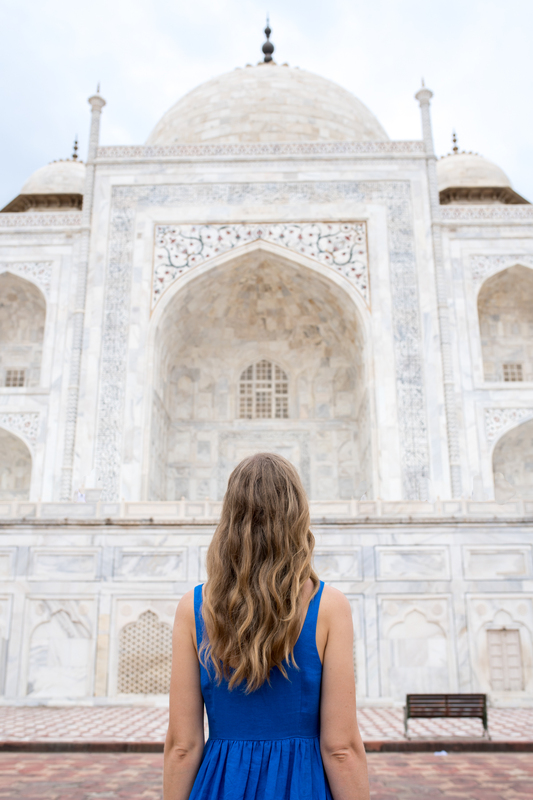 Considered by many to be the most beautiful building in the world, the Taj is perhaps most beautiful because of the story behind it’s creation. 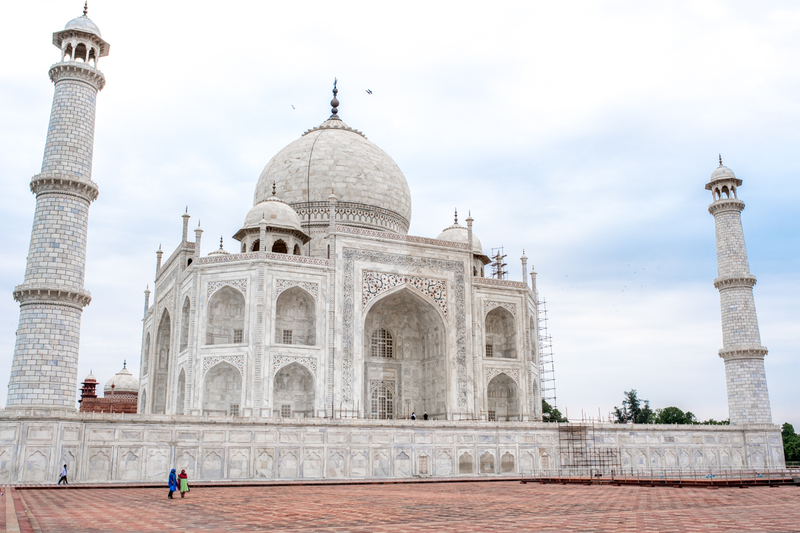 The impressive, white marble structure was built over the course of 20 years by Mughal emperor Shah Jahan as a tomb and declaration of love for Mumtaz Mahal, his cherished wife who died after giving birth to the couple’s 14th child. 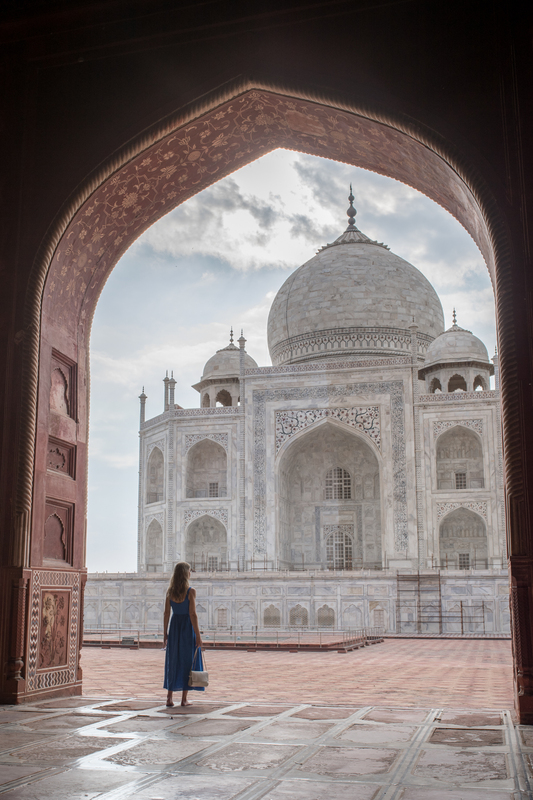 The project began in 1632 and took over two decades to complete, and today it remains the best example of Mughal architecture, which reflects Indian, Persian and Islamic influences. To visit the Taj, we woke up at 4am to ensure we were some of the first in line to enter when the gates opened at 5:30am. 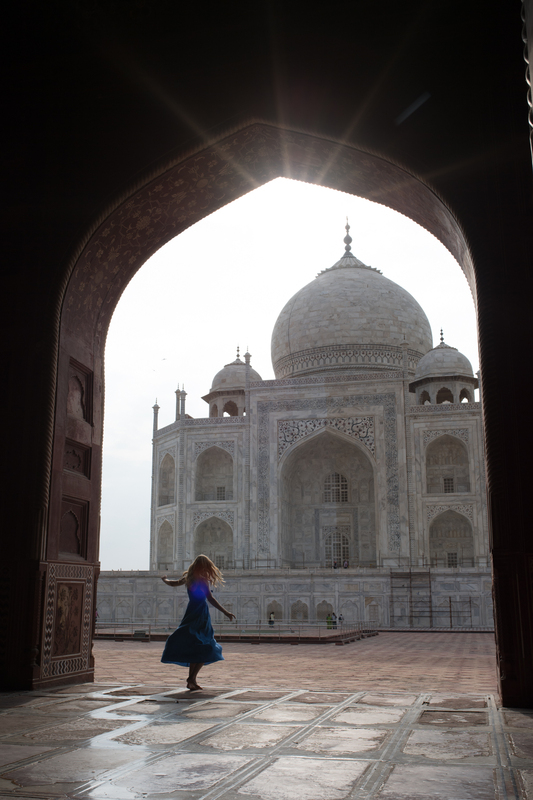 There are three entrances to the Taj Mahal, and they open at different times. The earliest you can get in is 5:30 AM through the east gate. 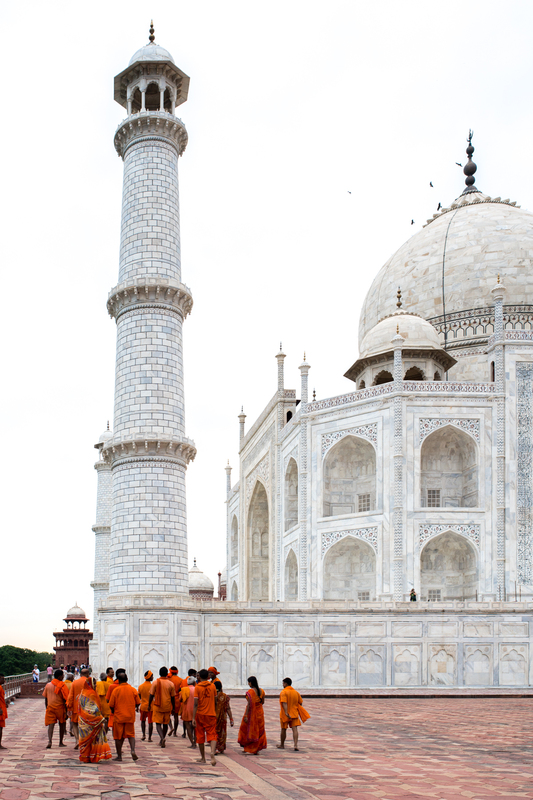 Sadly, as we passed through the first arch and the main building came into view, we realized the entire front of the Taj was covered in scaffolding so they could clean the marble! 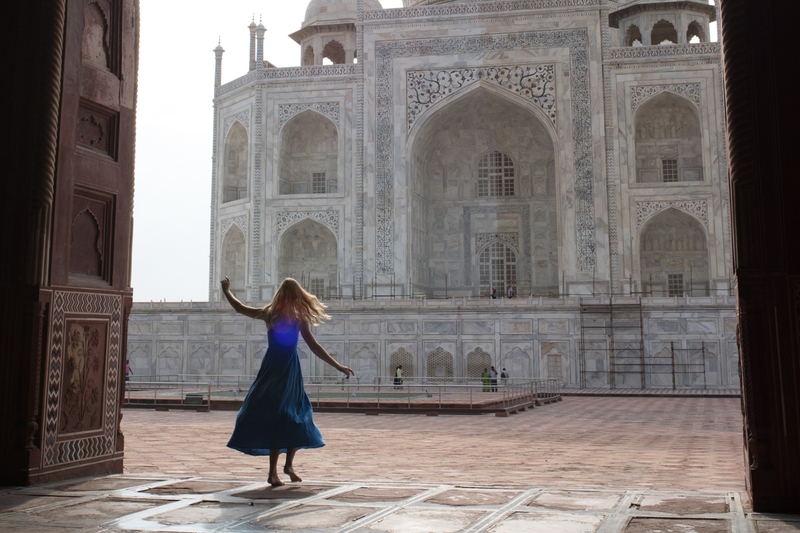 I was really disappointed, but since all four sides of the Taj are (nearly) identical, we decided to head through the garden to the mosque at the left side of the monument in search of an alternate view without scaffolding – and we’re so glad we did! Most of our fellow visitors stopped to take photos at the “Diana bench” despite the scaffolding, so we were able to enjoy the Taj almost entirely to ourselves for about 5 minutes before others started to trickle in. 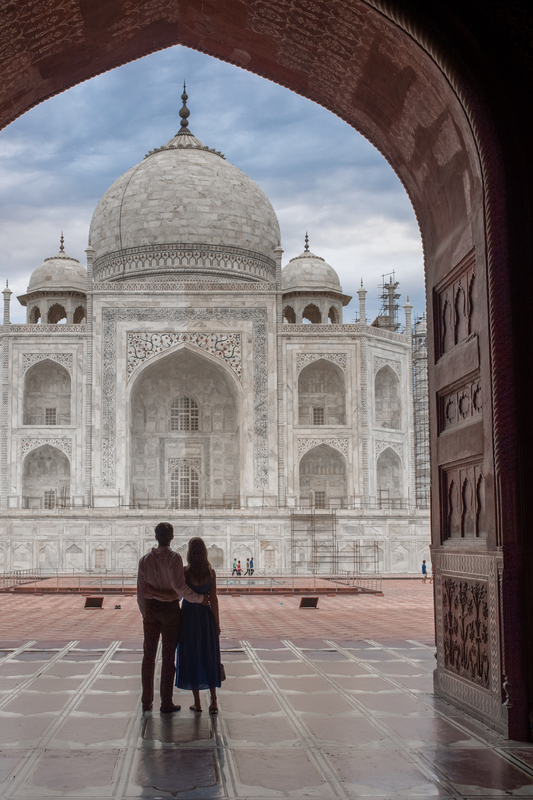 Since it’s a tomb and monument to a terrific love, I believe this is the best way – and the intended way – to experience the Taj in the quiet of the morning. We spent about an hour walking the grounds as the sun rose higher and higher, and ended up sitting on a bench because I wasn’t feeling well. A few minutes later I noticed a man in orange taking a selfie with me in the background, and looked behind me to see a dozen people standing in a line and smiling, all clad in saffron – from head to toe! I burst out laughing and the selfie-taker took this as sufficient permission to start a photoshoot. David jumped in to snap several photos of the scene as well. 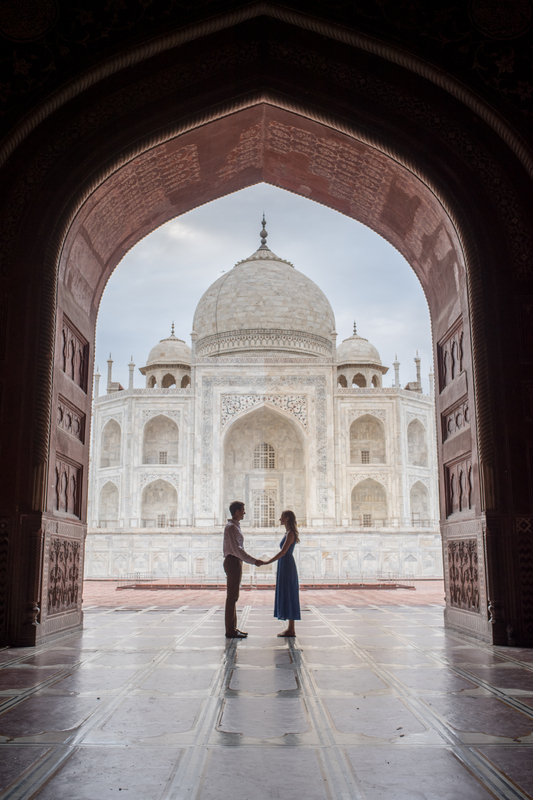 They only spoke Hindi (or possibly another India language) and we only English but for 10 minutes we took all took photos and shared laughs, resulting in some of our favorite images from our trip! 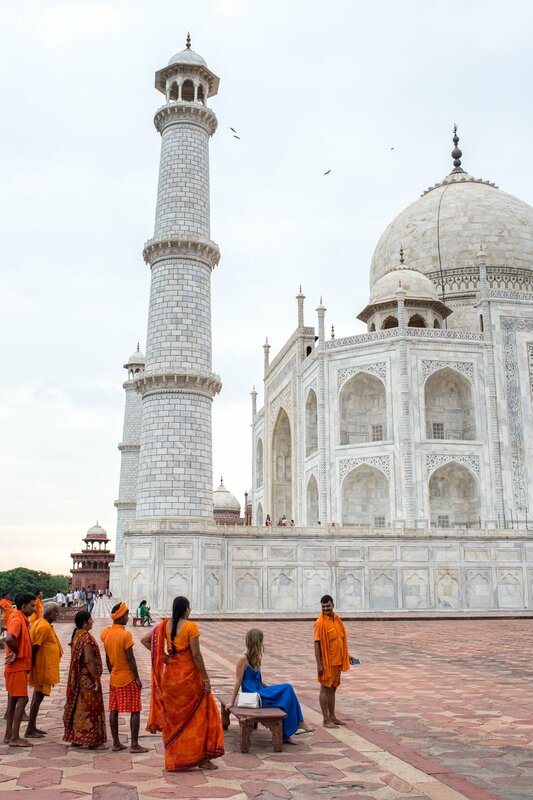 After they moved on I was told by another visitor that the group in orange was on a spiritual pilgrimage, bringing water from the Ganges to the Taj. I’ve tried researching their exact beliefs but haven’t been able to unearth anything.